Students, faculty and staff members are invited to attend this year’s University Conference taking place Feb. 27. The conference’s theme is “Engaging and Transforming Students.” Dr. Stewart Ross, founding director of the Center for Excellence in Teaching and Learning at Minnesota State University–Mankato, will deliver the Baldwin Lecture on “The Joy and Responsibility of Teaching Well.” The lecture will be followed by a hands-on course design workshop. The preliminary conference agenda is located at the 2014 University Conference website. Minor changes will be made to this online preliminary agenda as they occur. The final agenda will be available by 12 p.m. Feb. 26, and printed copies will be available at the registration table that will be initially located outside Violette Hall 1000 and then in the Student Union Building. Pre-registration was required for the luncheon and course design workshop, but is not necessary for other events. The free concert will begin at 2 p.m. March 1 in the Ophelia Parrish Performance Hall. New Muse Piano Duo, an ensemble dedicated to commissioning and performing new music, will be appearing this season at various locations in the Midwest as well as Greece, Cyprus and Norway. Following their concert, Savvidou will present a workshop at 3:30 p.m. entitled “Practicing With Awareness.” Following her presentation, at 4:30 p.m., Kuuskowski will present “Career Envisioning Workshop.” These events will take place in Ophelia Parrish 2115. They are also free and open to the public. This event will begin with brief introductions, keynote address and discussion at 2:30 p.m. in the Student Union Building Alumni Room followed by breakout sessions at 3:30 p.m. where students are encouraged to get a more in-depth look at the professional career of one of the speakers. The day will conclude with a social hour in the HUB at 4:30 p.m., giving faculty, staff and students the opportunity to informally visit with the speakers over light refreshments. This program is sponsored by the Office of Advancement and the Career Center. 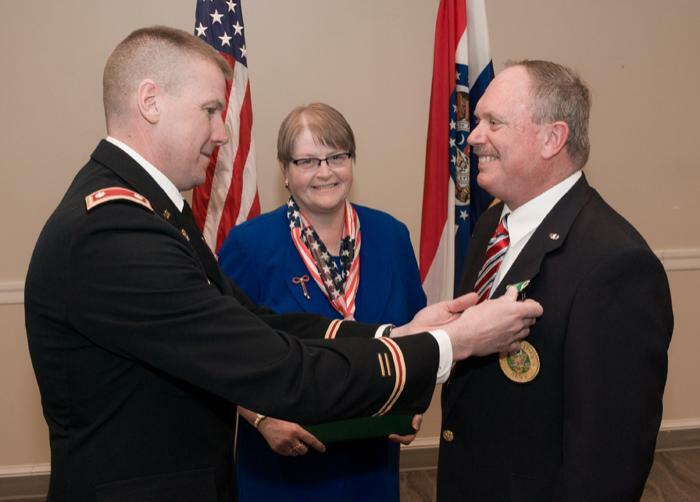 With friends, family and co-workers gathered together, Roger Marsh, director of campus mail services, was awarded the Army Commendation Medal Feb. 18 in the Student Union Building. Although more than 30 years have passed since Marsh’s service in the U.S. Army, he just now is receiving recognition for his dedication because the paperwork for the honor previously had been misplaced. However, with the help of Rep. Sam Graves, Marsh received sponsorship for a request to relocate his award. Five years after the initial request, and after a long process of contacting old officers and filing various forms, Marsh got word that he would finally receive the commendation medal. Having worked at Truman since 2006, he requested the ceremony take place on campus with the help of Truman’s ROTC. After the presentation of a letter of recognition from Graves, Lt. Col. Steven Petersen gave remarks to those in attendance at the ceremony. Following Petersen’s speech, Marsh received the Army Commendation Medal. At the end of the ceremony, he addressed the crowed with gratitude. Roger Marsh, right, accepts his Army Commendation Medal from Lt. Col. Steven Petersen. His wife, Irmgard, center, was by his side during the ceremony, which took place Feb. 18 on campus. Registration for the Big Event is open now until March 19. If students would like to participate as individuals, they can register themselves. If students would like to participate with an organization, their organization will be in charge of registering the group. Registration will be online. Any questions can be directed to serve@truman.edu. Linguist Christopher Strelluf will participate in the Department of English and Linguistics “For Words” speaker series at 7 p.m. Feb. 25 in the Student Union Building Conference Room. Strelluf will discuss “The Dialect of Kansas City: Language Change in the Heart of America.” He was recently interviewed about his research by Kansas City’s NPR affiliate. Strelluf is the editorial assistant for the Journal of English Linguistics, the founder and past president of the Linguistics Society of Missouri, served in Operation Enduring Freedom as a member of the U.S. Army Reserve and currently teaches linguistics at Truman. HIV testing may take approximately one hour, with same day results, and just a finger stick is involved. The urine test for gonorrhea and chlamydia may take approximately 30 minutes and will be sent to a laboratory for processing. Those results will be provided at the Student Health Center. Testing is confidential. Lambda Pi Eta, Truman’s communication honor’s society, is hosting their annual Communication Week Feb. 24-28. Events will be hosted throughout the week to help students improve in various areas of communication, networking, resume building and more. Sponsors for COMM Madness week are: Lambda Pi Eta, Advertising and Public Relations Club, TMN Television and the National Communication Student Association. The Art of Living Club will sponsor an intensive weekend workshop on yoga, yogic breathing and meditation on campus Feb 28-March 3. Information about this workshop and an opportunity to register will be presented from 7-9 p.m. Feb 26 in McClain Hall 210. The presentation is free and open to all students, faculty, staff and community. The workshop focuses on removing stress and increasing peace and happiness by regular practice of high-powered yogic breathing techniques. Students need to attend the whole workshop over the four days: 7-10 p.m. Friday and Monday; 10 a.m.-4 p.m. on the weekend. For more information, contact Lloyd Pflueger at lloyd@truman.edu or 660.785.4056, or visit artofliving.org. The Truman State University Foundation is pleased to announce that scholarship applications for Truman students for 2014-2015 are available now. This is the largest Foundation scholarship application period of the year. Applications are due by midnight, March 6. To apply, log into TruView and go to the Student tab, Student Finances channel. These scholarships are available thanks to the generosity of alumni and friends of the University. The School of Health Sciences and Education and the Department of Education are offering an internship worth 12 credit hours to teach English as a foreign language in the Guangdong Province of China, August-December 2014 and February-May 2015. There will be an informational meeting for SA CHN 550(G) EFL Internship in China 7 p.m. March 4 in Baldwin Hall 244. For more information, contact Timothy Farley at tfarley@truman.edu. The Funds Allotment Council (FAC) is now accepting funding applications for the fall 2014 semester. Both student organizations and ICA teams may apply for funding. Applications can be found and completed online at fac.truman.edu. They are due by 5 p.m. March 5. For questions, stop by the FAC Office, Student Union Building 1109 A during office hours (Monday-Thursday 9 a.m.-4:30 p.m.). Questions can also be emailed to tsufundsallotmentcouncil@gmail.com. FAC is dedicated to the intellectual and social development of students and to enhancing their entertainment opportunities. FAC expresses this commitment through the financial support of activities that are organized and sponsored by chartered student organizations. The council strives to fund a variety of activities sponsored by a variety of organizations that will benefit all members of the student association and the larger University community. Tru-Strength is a FREE, 1-hour weight room orientation led by Manny, an ACE certified personal trainer. Sign-up at the weight room desk. Space is limited. For specific dates, times and more information, visit recreation.truman.edu/trustrength.asp. FREE body composition assessments will be offered between Feb. 24-26. Sign-up at the weight room desk. Space is limited. For more information, visit recreation.truman.edu/fitwellbodycomposition.asp. The library is currently featuring a display based on films that originated as books. Films highlighted include Academy Award winners, Hollywood classics, family films and much more. This exhibit will be available for public viewing until March 24. All Truman students are eligible to enter an essay contest sponsored by The Council of Public Liberal Arts Colleges (COPLAC) for a prize of $500. The COPLAC Board of Directors, in memory of the contributions of David J. Prior to the advancement of the consortium and to student success in the public liberal arts sector, are sponsoring the second annual student essay prize in his name. The David J. Prior COPLAC Award recognizes two senior-level undergraduates whose academic careers and future goals have been shaped by the transformative power of the liberal arts and sciences experience at a COPLAC institution. Each student’s reflective personal essay will highlight one or more of the following features of COPLAC’s student-centered approach to teaching: emphasis on active learning; ethical reasoning; interdisciplinary approaches to knowledge; community engagement; critical and reflective skills; and connections between liberal learning and informed, active citizenship. Essays should focus on the value of a public liberal arts education and avoid multiple references to the particular virtues of one’s home institution. David Prior’s career-long commitment to superior undergraduate teaching, his desire as a consortium leader to make the outcomes of an education at public liberal arts institutions widely recognized, and his deep concern that all students, regardless of financial circumstances, have equal access to a high-quality education anchored in the liberal arts and sciences, will be reflected in each of the prize-winning essays. All submissions for the David J. Prior COPLAC Award must be original essays, under 1,200 words in length, typed, double-spaced and composed in Microsoft Word format. Submissions should be sent via email attachment to provost@truman.edu no later than March 1. The competition is open to seniors in good standing that will graduate in spring or fall of 2014. Each campus, using its own review and selection process, will select one essay and forward it to the COPLAC Office no later than March 15. A review panel consisting of former COPLAC presidents/chancellors and provosts will select the winners. Each winner will receive an award of $500 and their essay will be featured in the Spotlight section of the COPLAC website. The School of Business and New Student Programs are accepting applications for academic peer mentor scholarship positions for the 2014-2015 academic year. Academic peer mentors support the professional and faculty advising staff by providing an academic outreach program to first-year students who are pre-business/pre-accounting majors or who are considering these majors. These positions are limited to School of Business majors who will be at junior or senior status in the 2014-2015 academic year. Position descriptions, applications and recommendation forms can be obtained at the Business Academic Advising Center located in Voilette Hall 2413. Applications are due March 17. For more information contact Billi Gordy, business academic advisor, at bgordy@truman.edu or Mark Weidner, head academic advisor, Center for Academic Excellence, at mweidner@truman.edu. Student tickets are now available for the March 29 Student Activities Board spring concert featuring Hoodie Allen. General admission tickets will be available starting March 3. Tickets are free for students and $5 for general admission, and may be picked up between 9:30 a.m.-3:30 p.m., Monday through Friday, at the SAB Office in the Student Union Building. The 4th Annual Kansas-Missouri Renaissance Symposium will take place from 5-7 p.m. Feb. 24 in Ophelia Parrish 2210. It will feature talks about exciting new research by four leading specialists on Italian Renaissance art, architecture and visual culture. A guest recital will take place at 8 p.m. Feb. 24 in the Ophelia Parrish Performance Hall, featuring Daniel Sheridan, clarinet; Wobin Park, piano; and David Leung, viola. Andrea Shelley, Hy-Vee’s registered dietitian, will give a nutrition presentation from 12:15-1 p.m. Feb. 25 and Feb. 26 in Violette Hall 1144. Both days will cover the same information. Topics include learning how to navigate the grocery store, reading food labels and implementing Hy-Vee’s nutrition counting system called NuVal System. The presentation is free to all students, faculty, staff and the Kirksville community. This event is sponsored by the wellness committee and in conjunction with TruFit. For more information, contact Miranda Kolenda at mkolenda@truman.edu. “Liberal Arts After Truman” will take place at 7 p.m. Feb. 26 in the Baldwin Hall Little Theatre. Alumnus Justin Hartmann, a St. Louis news producer for KTVI-TV will discuss how he applied his liberal arts degree to score his dream job. This presentation is sponsored by Lambda Pi Eta as part of their “Comm Madness” week. Alpha Chi Sigma will host a public tie-dye event from 3:30-6 p.m. Feb. 28 in Magruder Hall 1027. Prices vary per item. Items must be 100 percent cotton. They will also be selling plain t-shirts for $5, plus cost of dyeing. For students interested in staying in their on-campus residence during midterm break, the deadline to register is 5 p.m. Feb. 28. More information can be found here. The deadline to sign up for Truman Live! auditions is 5 p.m. Feb. 28 at sab.truman.edu. Auditions will take place from 2-5 p.m. March 2 in the Student Union Building Down Under. Missouri Hall will sponsor the Mr. MO Hall Competition at 7 p.m. Feb. 28 in the Student Union Building Activities Room. The Catholic Newman Center will host a Mini Golf Fundraiser Feb. 28 and March 1. For more information, contact president@newmantruman.org. Tau Lambda Sigma will be collecting new or gently used clothing from 10 a.m.-3 p.m. March 3, 4 and 17 in the Student Union Building. Items will be sold at their Semi-Annual Thrift Shop taking place from 1:30-7:30 p.m. March 19 in the Student Union Building Activities Room. All proceeds go to the American Cancer Society. The Center for Student Involvement will host a Mardi Gras Celebration Party from 7-9 p.m. March 4 in the Student Union Building Hub. There will be activities, food and live music. Wind Symphony II will perform in concert at 8 p.m. March 5 in the Ophelia Parrish Performance Hall. Wind Symphony I will perform in concert at 8 p.m. March 6 in the Ophelia Parrish Performance Hall.